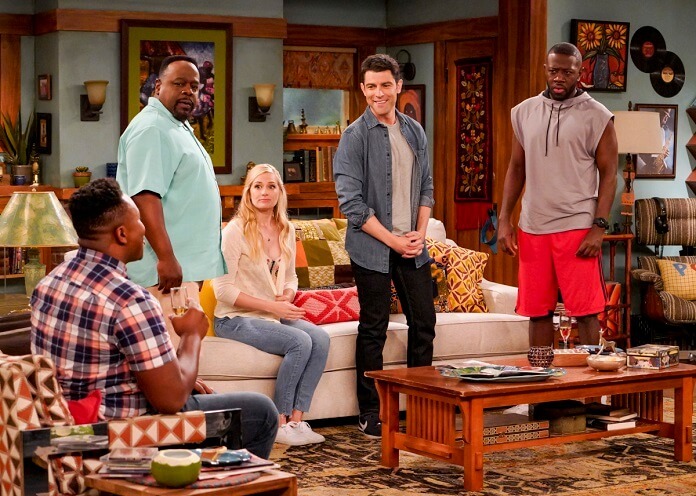 Max Greenfield has moved onto CBS and into a lot of hot water. In The Neighborhood, Greenfield plays a father who moves his family to an all black neighborhood. His next door neighbor (Cedric the Entertainer) is not happy about it at all. Greenfield spoke with reporters after a Television Critics Association panel on The Neighborhood this summer. Greenfield joined the show after the pilot, replacing another actor. He also has a role in the gender-flipped comedy What Men Want starring Taraji P. Henson, and The Neighborhood airs Monday nights on CBS. What was it about this character that you liked? Now what do you like about him since you’ve been playing him? Max Greenfield: “What I love about the character and his situation in the show is that they’re coming from Michigan. They probably got to L.A. and looked at an apartment near the La Brea tar pits. I’m sure they saw a bunch of apartments, realized they couldn’t afford any of them, and then he found this beautiful house with a backyard. It was just like he had in Michigan and he fantasized about this vision for his family and what he wanted to create for them. It was similar to what they had. The only difference was this neighborhood. After playing Schmidt for so long, is it nice to play a really solid family man? Were you apprehensive about doing another TV series? Does The Neighborhood remind you of other shows? What kind of guy do you play in What Men Want? What was it like adapting to multi-camera sitcom with an audience? Max Greenfield: “Well, that was really what I wanted to do so much. I was really lucky. I got to do an episode of Will & Grace last year. I had done some Hot in Cleveland episodes while New Girl was running. And having shot New Girl for seven seasons, the way we shoot New Girl is not different from how you would shoot a movie. I was inundated with that style for seven plus years. There isn’t that much excitement left in that type of production. How has this job affected your sensitivity to talking about race and cultural things? Are you pitching ideas from your own experiences? Will you find more drama in your breaks from The Neighborhood? Is comedy where your heart is?